From left Councillor Carol Lindsay, James Wallace of Kirkcaldy and District Pipe Band, Robert Main, George Wallace Kirkcaldy and District Pipe Band. 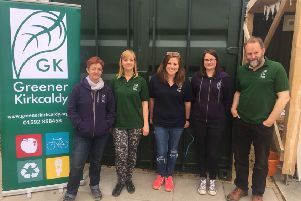 A delegation from Fife has been helping to celebrate Kirkcaldy’s links with its Bavarian twin town Ingolstadt, as the Langtoun gets set to host another party in the Town Square later this year. Representatives from Kirkcaldy attended the twin town’s Bürgerfest event in Germany at the weekend, which translates as “citizens’ fayre”. A number of towns and cities which have been twinned with Ingolstadt attended the event, with stalls, street performers, music and food. As the Fife delegates represented Scotland, Kirkcaldy has now been invited to plant a garden in a plot of land for when Ingolstadt hosts the State Garden Show in 2020. Among those from Kirkcaldy were councillor Carol Lindsay, Robert Main, chairman of the Kirkcaldy Ingolstadt Association, and representatives from the Kirkcaldy and District Pipe Band. Robert said: “The hospitality, as always, was exceptionally generous. “It’s important for everyone to use the opportunity to learn about different ways of life, cultures, and habits. “It provides significant opportunities in supporting cultural and economic links which we’ve proven successfully through various groups within the town that have established twinning links. “There’s a great deal of attractiveness for many to come to Scotland, in terms of its landscape and the similarities in character. Councillor Lindsay, said: “The town was beautiful and the people were lovely, very friendly. “One of the interesting things that we’re going to work on is the plot of land Kirkcaldy’s been given for the garden show. We’re going to look at how we can develop that, if we can get funding, what groups we can get involved, and how we can design it to reflect Kirkcaldy. Meanwhile, it will soon be Kirkcaldy’s time to have some fun, with a twinning celebration in the Town Square at the start of September. A marquee will house community events, a Bavarian band, and a local Scottish craft brewer who makes a Bavarian-style pilsner.